"See and Hear the Difference!" Dance Sounds Disco is one of Sheffield's most in-demand professional Mobile Discos offering a high quality service for your Wedding, Party or Celebration. 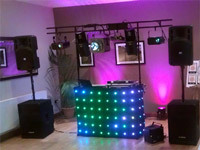 I can offer you a professional DJ with 20 years' experience, quality presentation and service, professional-grade lighting and sound equipment, music tailored to your taste from the 50s through to today's latest charts, dance and R+B, versatility to help ensure your party is to your requirements. Are we right for you? Dance Sounds Mobile Disco provide entertainment for a wide range of events but are we the right disco for you? Everybody has differing tastes and requirements so we offer and recommend a free consultation meeting to help us provide you with the best possible service. Required by many venues, Dance Sounds Mobile Disco has not provided satisfactory evidence of having current PLI available. Also required by many venues, Dance Sounds Mobile Disco has not provided satisfactory evidence of having current PAT records available. Why do people choose to book Dance Sounds Mobile Disco? "Craig did a great job at our party, playing music to suit all tastes from a diverse age group. It was a great night and Craig helped to make sure all the guests enjoyed themselves. Reliable and easy to do business with, this disco is highly recommended." "Excellent service tried to rebook but unavailable. Will use again for events"
" Craig was brilliant and would highly recommend him plus if I was to have another event I would definitely use him"
"Craig was fantastic. Played all the songs we asked him to straight away. Our guests (young & old) commented on how good the DJ was. Set up was early and quick and his equipment was top notch. Very professional but a nice approachable chap. Will definitely recommend him and will be using him again in the future. Thanks Craig." "Friendly,helpful.provided a good service did everything he was asked would use again"
You may contact Dance Sounds Mobile Disco directly using this form. If you are contacting Dance Sounds Mobile Disco about an event, it's always a good idea to include the DATE, LOCATION, EVENT TYPE, AGE GROUP and TIMINGS to speed things up!